Okie... First thing first, me and my mr.fiancée dah decide to get married in August (yayyyyy 😊). The thing about wedding preparation is... You have to allocate at least a year (I repeat.. a year okayy) to plan your wedding or at least the thing that you have to deal with first is the location. 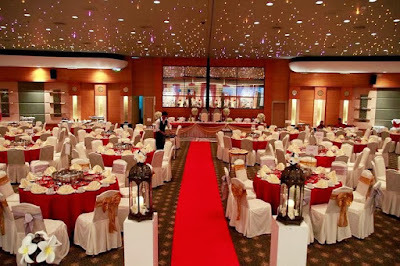 Well for those who are doing their wedding dkt rumah I think it should be fine but we're planning to combine the reception from both sides so we need a hall. 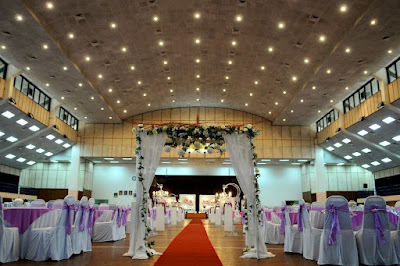 Dgn semangat b2b yg berkobar2, I started my research on halls that is available for wedding events. Our main focus is area selangor and kl la since we're both from selangor je. From what I can see is almost all the blogs and website that I've visited, they displayed (some websites won't even display the price, you have to call them) a really really old quotation. This is actually my first choice after viewing sooooooo much of blogs. It's new, it's big, lots of parking and quite convenient as there's a masjid in front of it. They also have changing room for the pengantin to get ready. 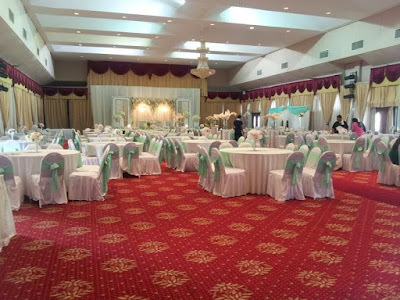 Okay, a lot of blogs recommended this place, with rate of rm1600 for hall rental and you can rent carpets to cover the parquet as well, with additional cost of course. But all in all maybe we can budget for rm2000. It's very reasonable for me and I called the PIC. Guess what, they have sub-con the hall to Kuzie Catering (siapa yg x tahu, the catering is by Pak Engku, the one who usually handled retis2 punya wedding. Kalau x silap he did for siti nurhaliza punya wedding as well). Well, tough luck, they no longer rent out the hall on its own. Kalau nak, you have to take his package, rm36 per head (I died a little inside huhuhu). Previously he handled Dewan Cattleya PKPS in S.Alam but I'm not sure what happened to that. 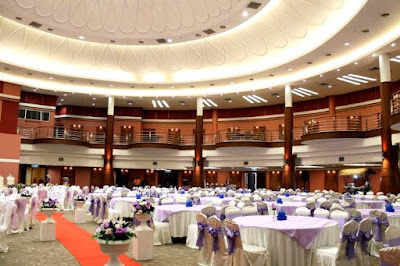 I tried looking for a hall that looks almost like the community hall dkt bukit damansara tu and these are the one that I think is okay enough. 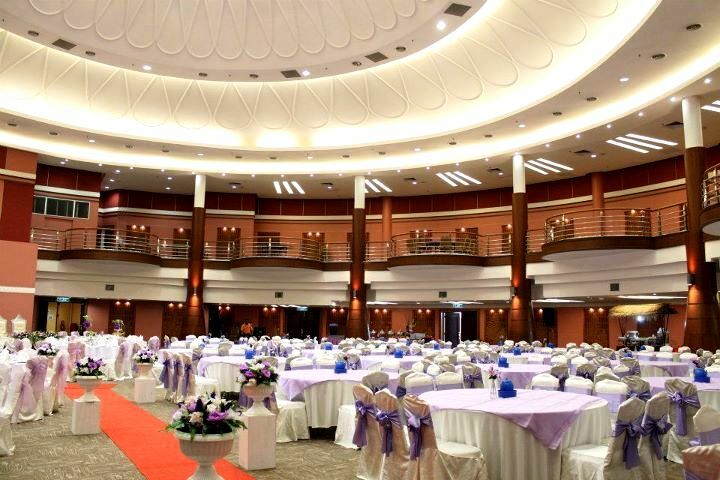 This hall looks almost similar with the bukit damansara community hall as they are oval/round in shape. The rate is affordable as well, they charged rm3000 for hall rental (this price I got it from another blog since my call wasn't answered) but the catch is you have to pick the caterer based on their list. Hmmmm I mmg x gemar betul kalau limited choice mcm ni. So this hall mmg pangkah la. But it's a very nice hall though. 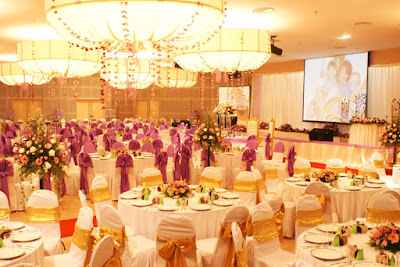 Hall sangat cantik but you have to use their caterer.. If not mistaken rm35 per head (rasanya la, I've gone through so many blogs and website and everything dah jadi ABC in my brain). You can visit their website to find out more. This one is actually my favorite.. 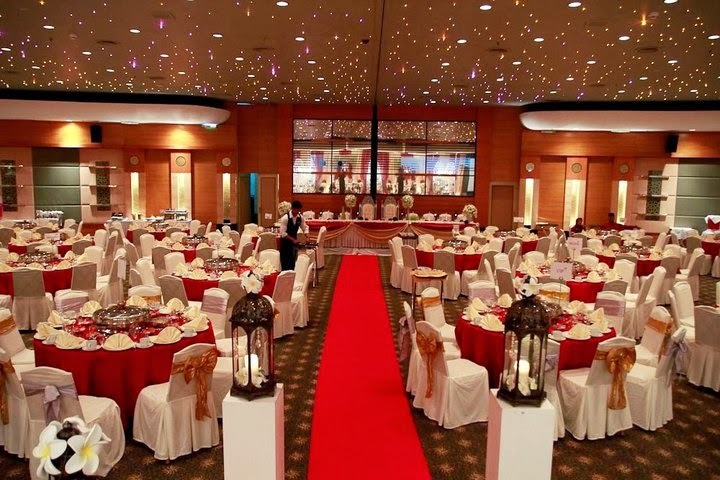 It's suuuuper beautiful, it makes you feel like you're having a fairy-tale like wedding huhu.. Their concept is *datang and kahwin je* since they'll prepare everything for you. But the price is out of my budget huhuhu but for those who's interested with, they charged rm35-40 per head. According to the PIC, it's near The Mines. They charged rm5000 (not sure if there's gst or not) for the hall and complimentary tables and chairs for 250pax (w/o cover though), buffet table, doorgift table etc.. You can contact them for further info. One thing to note is their hall has big pillars here and there so it's not to my liking. This hall comes with caterer as well, there's 2 vendors actually. Vendor 1 charges rm25 per head all inclusive. 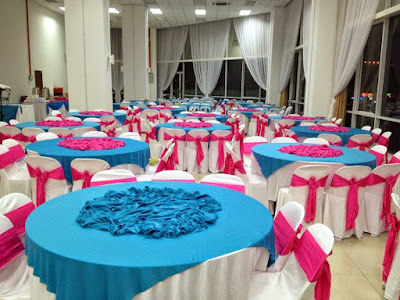 Vendor 2 charges rm14.90 only for catering and hall rental. I personally prefer the first vendor though and this is actually my back up plan in case I didn't find any good hall. Vendor 2... Somehow I felt that he was a bit rude while answering my enquiries, and I'm not going to let someone like that to handle my wedding so reject! Need to take package as well, if not mistaken rm35 per head. Handled by Gezal Minhat, they actually have 2 halls, intan and berlian. 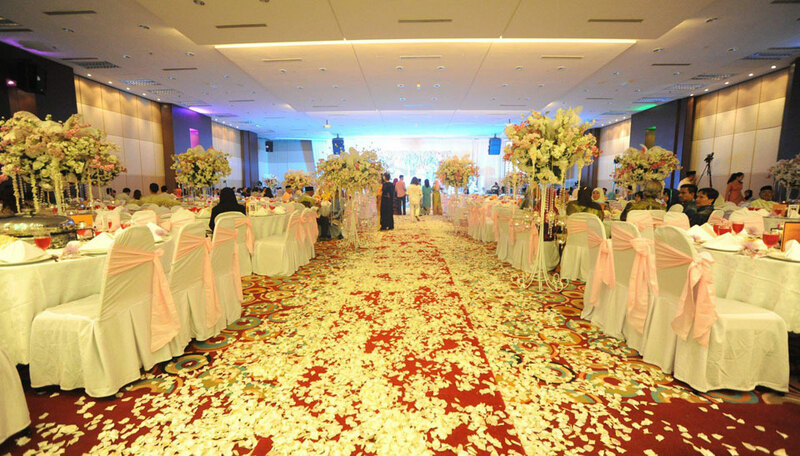 Intan is more of a contemporary theme while berlian is of garden wedding theme. I only asked about intan, you need to take their package in which they have the same price as Raja Muda Musa hall, rm35 per head. There's a lot more halls that I can't really remember; JKR Hall, Felda Hall, The Club Bukit Damansara, KGPA Hall, Guthrie Hall etc. Hehe.. This hall is actually located at the 10th floor of Maju Tower at Maju Junction. Not many realized that there's actually a hall there. 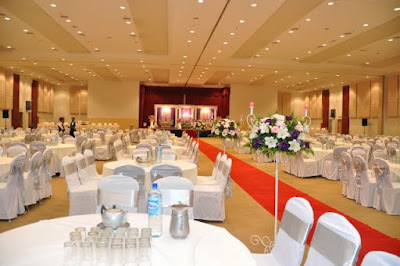 I've actually came across people talking about this hall here and there but my first assumption that the price might be expensive just by looking at the location itself. I finally dared myself to call the PIC and guess what... It's only rm5830 (including gst)!!! I mean, that's really cheap considering the location and all. Plus they provide almost everything; 35 tables and chairs (it can accommodate 350 people at one time) and with covers as well. There's kitchen for your caterer, changing room, VIP boarding room, they'll provide buffet table, doorgift table, gift table, PA system etc. And they'll even provide signage in the parking area (it's a mall, they have tonnes of parking) for the wedding as well as signage in the mall itself. They'll also provide a flat rate parking of rm5 per entrance so it doesn't matter how long you parked there, it's a fixed rate.